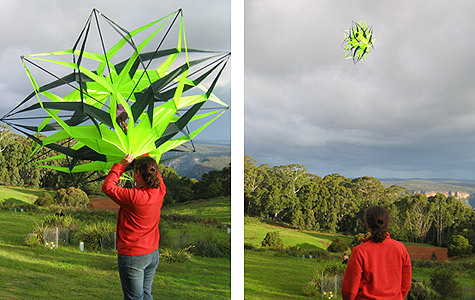 The kite is a 2M (about 6ft) diameter double star. The panorama below shows “Engogirl” with the kite waiting for some wind. We made the kite just before Easter and we’ve been keen to fly it but the wind hasn’t been strong enough ever since (typical!). The wind still wasn’t very strong today but at least we got the kite to fly out the whole length of our kite line (100m or about 300ft). Unfortunately the wind kept on dropping and at one stage I wasn’t able to reel in the kite fast enough and it fell over the cliff wall. We had had a few panicky moments at the kite got snagged on a bush we couldn’t see over the edge of the cliff. We couldn’t get near the edge of the cliff because the edge was at a steep angle and covered with loose rock. Even though the kite took about 50 hours to make we weren’t going to risk our lives for it. I eventually walked to the end of the headland, to a point where I could see the kite snagged in a bush half way up the cliff. Fortunately the braided kite line is very strong and I was able to drag the kite out of the bush using some “brute force and ignorance” to get it back up over the cliff edge. The kite is made of ripstop nylon and carbon fibre rods making it quite strong and it wasn’t damaged by the cliff incident. The wind picked up a little later on and we were able to get the kite up once more.